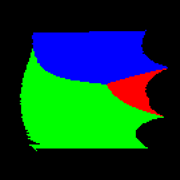 You are rotating in object-space using ray-positions y-coordinate! While object-space is the same as world-space in your case, as you didn´t translate or manipulate your object in other ways before rotating it. Sorry, didn´t want to let you look dumb or anything, but i guess this could confuse people if not clarified! added on the 2018-05-20 08:43:17 by ɧ4ɾɗվ. added on the 2018-05-20 08:46:03 by ɧ4ɾɗվ. No worries, thank you for the correction, and explanation. I have very little experience with shadertoy, and raymarching. So basicly i am dumb on the subject and anything helps me to gain a better understanding. Would it be more correct "per scanline" now? yes, if you want to let it look "oldskoolish" for sure! added on the 2018-05-20 10:24:32 by ɧ4ɾɗվ. I have some problems with displaying my rubber vector: how to avoid this bug (discontinuity at the bottom of the vector)? I display it by displaying lines of next frames. Isn't that just because you rotate it too fast? On the linked picture, there is a rotation of 1 degree at each line. If I make a rotation of 0.5 degree at each line, the bug disappears. So you're right. But when I watch Octorubber by Blueberry, his vector has a wide twisting, so I guess more than 1 degree of rotation at each line. Maybe I'm wrong or missing something? So nobody has an idea? It's hard to say from an unshaded still image, but my guess is that it is not a bug. It just so happens that the scanlines rendered with different time offsets create that shape. In Octorubber, the time shift propagates at 200 scanlines per second, so 1 degree rotation per scanline would mean a full rotation in less than 2 seconds. I don't think it rotates that fast. Even then, if you step through the youtube, you will see some frames here and there with artifacts very similar to the one in your picture. Could it be related to rounding errors? What happens if you rotate 0.5 degrees twice? Same exact result, or slightly different? Thanks you for the answer! As I wrote on ADA forum, now it works fine. As you said, I rotated each frame too much. page created in 0.008890 seconds with 4 queries.